Last night we had a Striper fishing charter in Norfolk Virginia. We fished in the York River and the Chesapeake Bay. Our fishing trip began at 7 pm so that we could fish at night time. Our marina is Vinings Landing Marina. Being Located along the Chesapeake Bay makes it a quick boat run to get to our fishing locations for Striper. This Striper fishing charter was a light tackle fishing trip. The Rod and Reel we used for this Striper fishing charter was Saragossa spinning reels and Shimano rods. This gear is light enough to allow the fish to pull drag but heavy enough to get the job done. There are various fishing techniques that can be used to catch Striper. The way we were targeting them this fishing charter was casting lures. At our first fishing location we could see Menhaden jumping away from feeding Striper. With the variety of lures that we had with us we decided to use larger lures. It is important when using lure to mimic the size of the bait fish in the area. There are a couple of good lures that we use for Striper when they are feeding on large bait. Some of these lures are Guides Secret Lures, Storm Shads, and Bombers. Menhaden are the most common bait fish in the Chesapeake Bay. Almost every predator fish in the Bay feeds off of Menhaden. They travel in large schools and are plentiful throughout the Chesapeake Bay. Once we saw that the Striper were feeding on the large Menhaden we knew that there were going to be big Stripers in the area. Striper this time of year feed aggressively in preparation to spawning. They feed heavily to get as fat as possible for energy. As we arrived to our fishing location and began to cast it was fish on! Within our first 3 cast we had our first Striper. Most of our fish on this Striper fishing charter average was about 30 pounds. Our biggest Striper was 46 inches! This time of year the Striper fishing is Catch and Release so all fish were released unharmed. Everyone on board the fishing charter caught big Stripers. Next time you are looking for an fun and exciting fishing charter book with Finao Sportfishing. In Fishing one of the most important things needed to learn are the best fishing knots to use. There are a variety of different fishing knots that can be used. On Finao Sportfishing we use 5 different fishing knots that get the job done. Each knot is unique to certain fishing lines and techniques used. The Mono-Filament fishing line that we recommend is Ande Fishing Line. The Braided Fishing line we use is Power Pro and Cortland. The Fisherman’s Knot (Clinch knot) is one of the easiest yet strongest knots there is. This knot is one of the first knots every fisherman needs to learn to get started. It can be used with Mono-filament and Braided fishing line. In the video below Captain Austin Hayne will go over step by step on how to tie the Fisherman’s Knot. The Palomar Knot is the strongest fishing knot in many situations. This knot only has 3 steps making it extremely powerful and very basic. Since there are not many twist and kinks in this knot it makes it extremely tough to break. It can be used on Braided line and Mono-filament. View the video below to see Captain Austin Hayne demonstrate how to tie the Palomar Knot step by step. The Uni Knot is the most common knot that we use on Finao Sportfishing. We use this knot because it is very quick and easy to tie. This knot is similar to the Fisherman’s Knot in strength and difficulty. This knot can be used with Braided line and Mono-Filament. Watch the video below to see Captain Austin Hayne tie the Uni knot step by step. The Hay Wire Twist is considered a knot but is more a series of twist. This “knot” is for using steel leader. This is the only knot that we use when using steel fishing leader. it can be a little difficult to tie but is a must know when using steel leader. Captain Austin Hayne will demonstrate how to tie the Hay Wire Twist in the video below. The Snell is the strongest knot for tying your hooks to fishing line. When this knot is done correctly it is almost unbreakable! We only use this knot with Mono-Filament line. With some practice this knot becomes very easy. It is the best knot to learn for connecting hooks to fishing line. Captain Austin Hayne will demonstrate how to tie the Snell. In Virginia we have some of the worlds best inshore fishing. On Finao Sportfishing we take advantage of the year round inshore fishing. Our custom built 24 foot Cape Horn boat is a fishing machine. It is designed around comfort, safety, and has plenty of room for multiple guest. Finao Sportfishing is located along the Chesapeake Bay on the border of Virginia Beach and Norfolk. In the Chesapeake Bay we have many different fish species. According to the time of year and temperature we have both Northern fish species and Southern fish species. Our most common Winter fish include Tautog, and Striped Bass. Tautog can grow to be over 20 pounds. 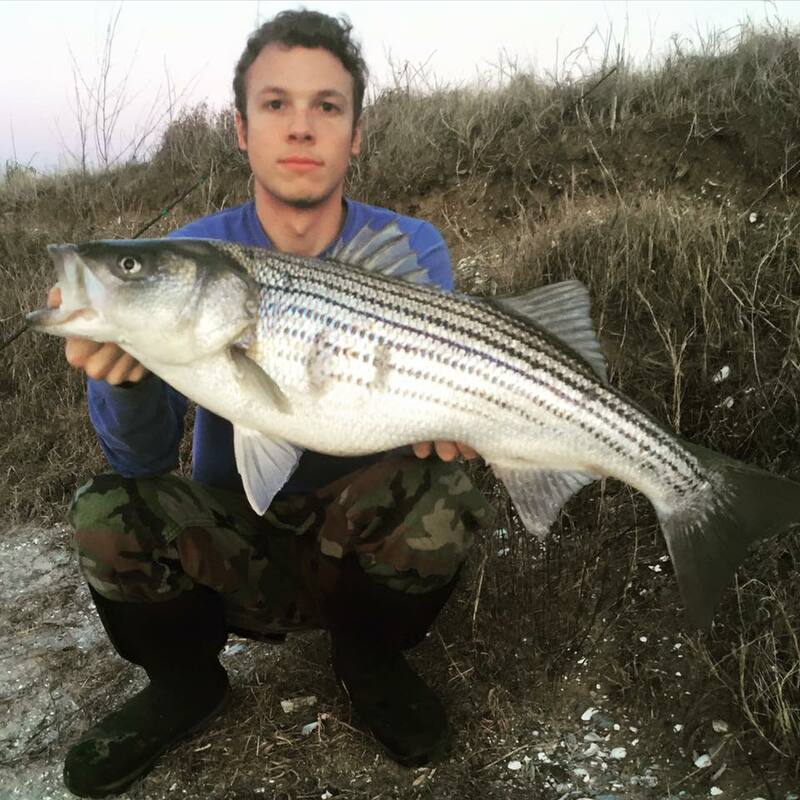 They are pound for pound one of the hardest fighting fish in the Chesapeake Bay. Striped Bass is possibly our most popular fish in Virginia. These fish can exceed to over 60 pounds. What makes Striped Bass so exciting is the versatility in catching these fish. Casting Lures, Live Baiting, and Trolling are our most common methods used for catching Striped Bass. Some of our most popular Chesapeake Bay Summer species of fish include Shark, Cobia, Red Drum, and Flounder. When Summer inshore fishing the first fish to move into the Chesapeake Bay are Red Drum. These fish grow to well over 50 pounds and put up a strong fight! The next inshore fish species that migrates into the Virginia is the Flounder. These fish are fun to catch because they are very hands on. We use jigs and small live baits for these fish. With a little bit of finesse these fish can be extremely rewarding to catch. Once June hits the water temperature hits about 70 degrees. 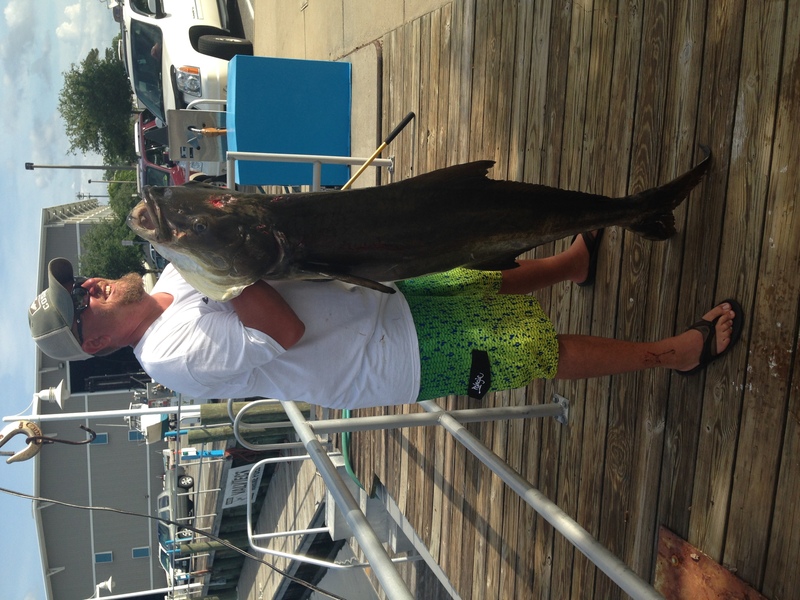 This warmer water brings in two giant species the Cobia and the Shark. 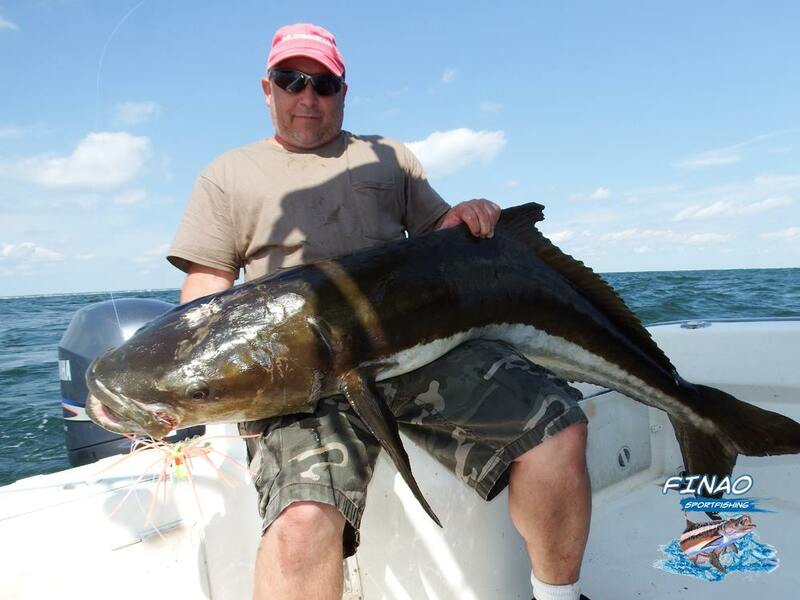 Cobia are one of the largest fish the Chesapeake Bay has to offer. They grow to over 100 pounds and are delicious to eat. Targeting these fish is one of the most fun fish we have to offer. Techniques like Sight Fishing, Chumming, and Jigging all work for Cobia. Shark are the biggest “fish” that we have to target when inshore fishing. Sharks grow to massive sizes and will eat just about any bait. With there body style and size Shark are powerful fighting animals that never give up. Last night we had our first Striped Bass fishing charter of 2016. We fished in the York River. Our marina is located in the Chesapeake Bay. This makes it a quick 15 minute drive to our first Striped Bass fishing location. With the warmer weather approaching we knew that the bait fish would begin to start moving into the rivers. In the early months of the year we have bait fish like Menhaden, Shad, and Silversides. When the water temperature gets around 45 degrees Striped Bass begin to become active and feed. This time of year is one of the best to target Striped Bass. In these early months they feed a lot to get fat to prepare to spawn. This Striped Bass fishing charter was catch and release because the season is not yet open. When targeting Striped Bass it is important to mimic the bait that they are feeding on. At our first location they were feeding on small Silversides. We could see the bait fish swimming on top of the water. These bait fish range from about 2 inches – 5 inches long. Even big Striped Bass feed on little baits. A good lure to use when mimicking a Silverside is Guides Secret Mucho Minnow. This lure has strong hooks and swims like a small bait fish. When we arrived our first cast we hooked a Striped Bass that weighed 20 pounds! Once he was released we started catching 1 about every 5 minutes. Our average size fish that night was between 10-15 pounds. We use light tackle gear when targeting these size Striped Bass. The gear that we were using was Saragossa reels, Shimano Rods, Power Pro Braided Fishing Line, and Tactical Angler Clips. This type of gear is strong enough to hold a big fish. At the same time it also is light enough to make the fish be able to fight harder! There are various lures that we used this night. Some of our favorite Striped Bass lures are Storm Shads, Guides Secret, Red Fin, and Daiwa Sp Minnows. Each of these come in different sizes for every occasion. This was a great Striped Bass fishing charter and an awesome way to start off our 2016 fishing season! Virginia fishing is one of the greatest fisheries on the East Coast. In Virginia we are placed in the middle of the East Coast. This gives us a variety of Northern fish species and Southern fish species. Virginia has great Inshore and Offshore fishing. On Finao Sportfishing we are an inshore fishing charter. With the Chesapeake Bay as our back yard to our marina it is a quick run to get into some of the Worlds best fishing! We are located on the border of Virginia Beach and Norfolk. This gives us access to fishing the Atlantic Ocean, Chesapeake Bay, and York river within minutes. Our Virginia fishing season is year round. With our mild winters most of the Northern fish species migrate into Virginia waters around October. Some of these fish include Tautog, Striped Bass, and Blue Fin Tuna. These fish will stay in Virginia until the water begins to warm up around May. Once the water begins to warm up we begin getting our Southern fish Species. Some of these fish include Red Drum, Black Drum, Cobia, Shark, Spade Fish, and Flounder just to name a few. Catching each of these fish species takes a different technique. Sight casting, Chumming, Float fishing, trolling, and jigging are some of the techniques we use when Virginia fishing. Booking a trip with Finao Sportfishing we have all the rods and tackle needed for these styles of fishing. This will allow you to learn these ways of fishing and catch fish of a life time! Many Virginia fishing species migrate into the Chesapeake Bay and York River annually for there spawning season. This gives us a unique advantage against other East Coast states for catching bigger fish. As many fish species migrate into the Chesapeake Bay and York River they are much larger and aggressive. When in spawning mode the fish eat and try to gain weight to spawn. This results in World Record size fish! There are various methods used to land big fish but learning how to gaff fish is one of the most important. A gaff is a long metal pole with a large hook on the end. It is used to lift large fish into the boat when the weight of the fish exceeds the strength of the rod and reel. This technique is used when looking to harvest the fish. When choosing the correct gaff it can get confusing. 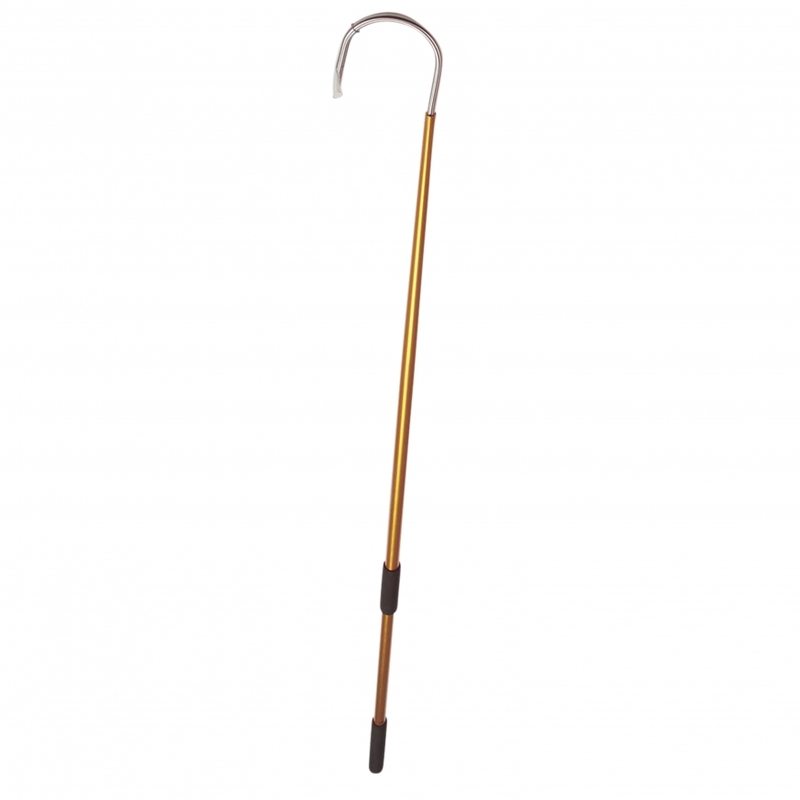 The variety of gaffs are like the variety of fishing rods almost endless. So when searching for the proper gaff you must think of size and strength. When purchasing a gaff keep in mind that it needs to be a durable gaff. You don’t want to buy just any cheap gaff. If you are using a gaff your most likely gaffing an Trophy Size Fish! The type of gaff that we use on Finao Sportfishing is a 6ft Aftco with a 5 inch gap hook. This size gaff is great for fish from 30-100 pounds. 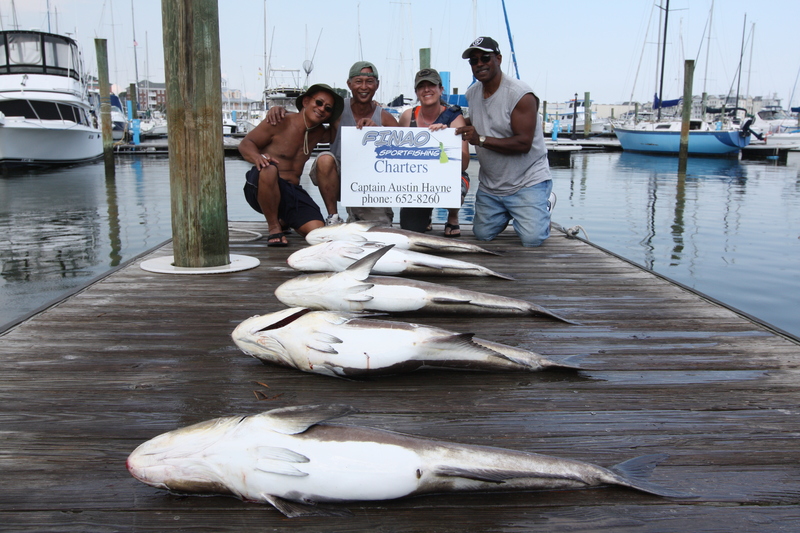 We use this gaff for many species in Virginia like Cobia, Amberjack, Rays, and Tuna just to name a few. Click the Video below to see Finao Sportfishing Gaff a Giant Cobia! Patience and knowing when to use the gaff is the first step. When using a gaff it is not always easy to get the fish to cooperate. The first thing we recommend is letting the angler fight the fish until the fish becomes exhausted. You can tell when the fish is beginning to get exhausted as it will usually come to the surface and not swim away. You never want to gaff a fish while it is still full of energy. It can cause the gaff to get ripped out of your hands or jump off of the gaff! Positioning the gaff and angler is very important. The person using the gaff needs to be placed next to the angler where the fish is going to surface boat side. Always make sure you are clear of the fishing line when using the gaff. One hit of the gaff on the fishing line can cause it to break. Once the fish is tired out and boat side on the surface it is now time to begin gaffing the fish. Knowing where to place the gaff can be the difference between landing and losing the fish. 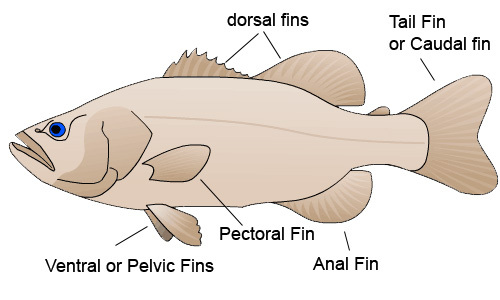 The best area to gaff the fish is behind the head underneath the Dorsal fin. Gaffing a fish in the head, tail, or stomach is never a good choice. Doing so can cause the fish to jump off the gaff and break free. As the fish is swimming on the surface slowly place the gaff over the fish’s back aligning the gaff hook up over the Dorsal fin. Accuracy and patience is one of the most important things to remember when gaffing. A common thing people do when gaffing fish is pulling the gaff extremely hard and fast. That can lead to missing the fish or ripping the gaff threw him. On these larger fish it is more about accuracy and allowing the weight of the fish to help the gaff pierce through. After you have the fish on the gaff it is now time to lift it into the boat. The longer the fish is in the water the higher chance you have of him coming off the gaff. Once you gaff the fish hold the gaff pole strong making sure to keep control of the fish. With two hands you want to pull the fish towards the boat. Once he is along the boat pull the gaff vertically up and over the railing. A common mistake that is made is trying to lift the gaff over the railing horizontally. If lifted like this the fish can slide off of the gaff hook. Watch these Videos Below to learn how Finao Sportfishing Gaff Fish. 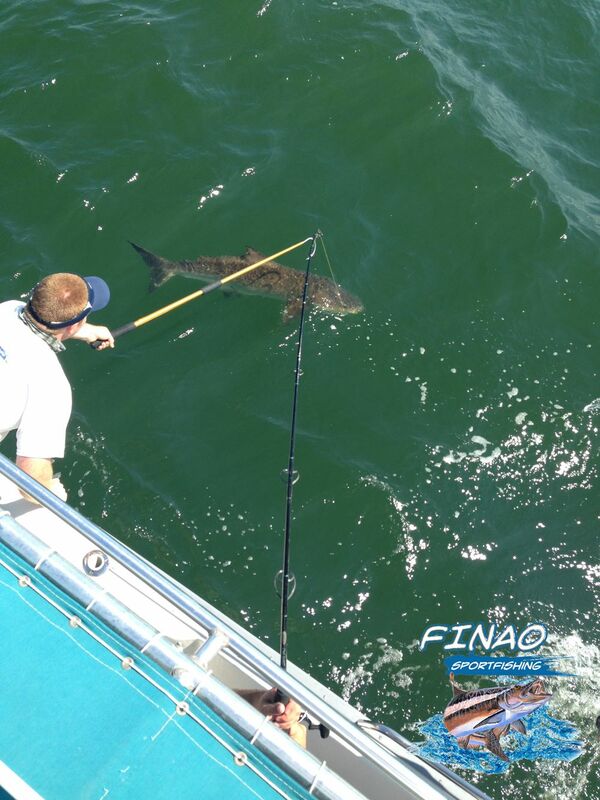 Finao Sportfishing specializes in inshore fishing charter trips. Located on the border of Norfolk and Virginia Beach. 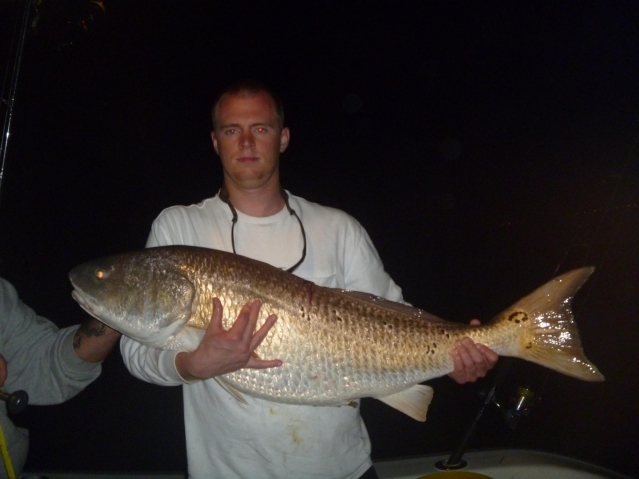 We have access to some of the best inshore fishing the East Coast has to offer. Virginia fishing is known for our fishery in the Chesapeake Bay. We have fish in the Chesapeake Bay year round and of all sizes. Popular species of fish like Striped Bass, Cobia, Red Drum, Black Drum, and Shark just to name a few. Many people try to decide between inshore fishing or offshore fishing. There are a few reasons we believe our inshore fishing charter is right for everyone. 1. The amount of time spent on the boat ride to get offshore is usually between 2-3 hours! On Finao Sportfishing our inshore fishing charter is usually a boat ride of 15-30 minutes. It is less time waiting and more time fishing! 2. Prices of an offshore fishing charter are going to vary but are always going to be more expensive than an inshore fishing charter with Finao Sportfishing. Our custom inshore fishing charter trips allow you to pick times and lengths of trips. This makes your fishing experience affordable and unique just to you. 3. People think that an inshore fishing charter produces “smaller fish”. 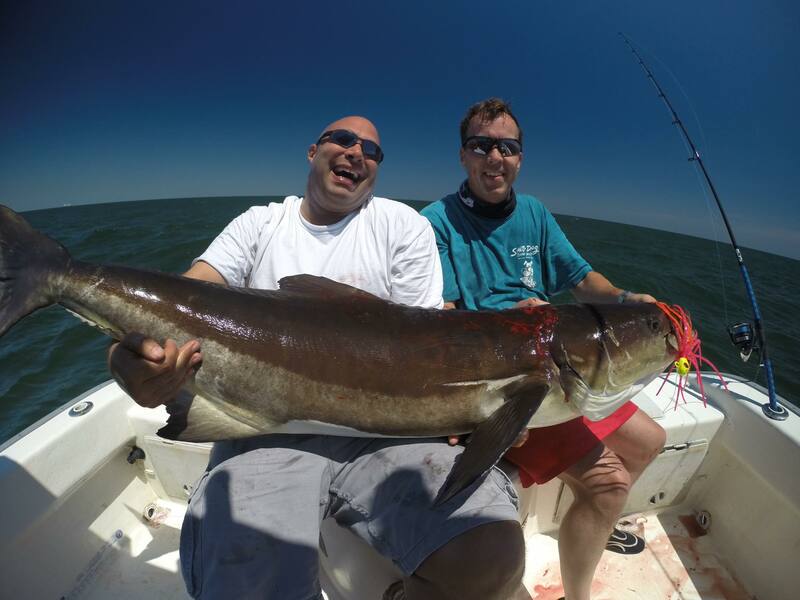 On Finao Sportfishing we target the biggest sport fish that the Chesapeake Bay has to offer. Fish like Cobia, Black Drum, and Shark can grow in excess of 100 pounds or more! Other fish like Red Drum and Striped Bass average between 30-60 pounds making them a large fish as well. 4. Offshore fishing charters are less hands on than an inshore fishing charter. When offshore fishing the most common technique used to catch fish is trolling. Trolling can be a very boring technique if the fishing is slow. On Finao Sportfishing inshore fishing charter we use a variety of techniques. Many include sight fishing, jigging, float fishing, casting lures, trolling, and bottom fishing. These inshore fishing styles make it more enjoyable for the angler because it is constant action. Watch the Video below to view a Inshore Fishing Charter trip for Striped Bass on Finao Sportfishing! 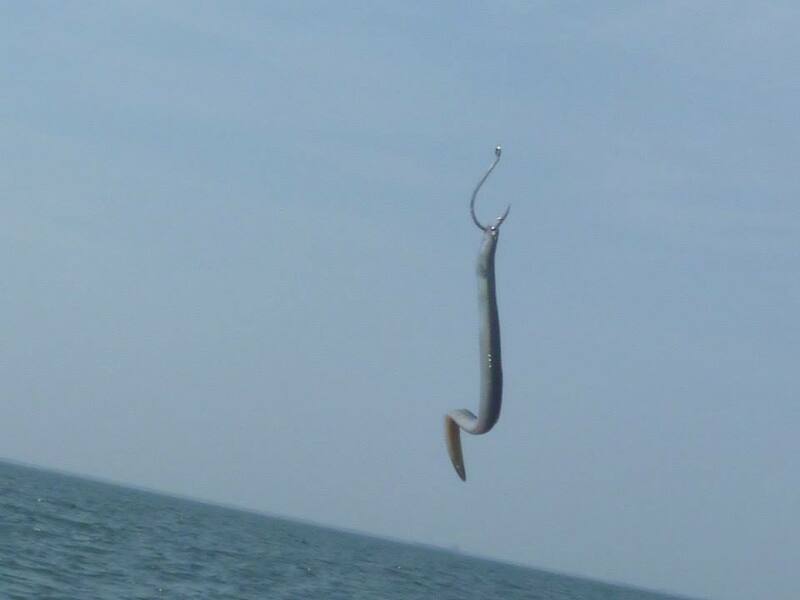 The Eel is a very common live bait in the Chesapeake Bay and we are going to go over how to hook an Eel. They are a great live bait for many species that we target like Cobia and Striped Bass. Eels are some of the best live baits to use since they are very strong and lively. They can go hours without needing to be placed in water and also can live in Salt water or in Fresh water. Eels are extremely slippery and can be difficult to hold so a rag is very useful when hooking these baits. There are a few different ways to hook an Eel. The best way to hook an eel is by hooking the eel from the bottom jaw out of an eye. When hooking the eel like this it allows the head of the eel to be pointed downwards. Most predatory fish react much stronger to a live bait that is swimming down as it looks as if he is trying to elude the predator fish. A good tip when hooking an eel is that once you have finished hooking the eel immediately place the Eel into water. This allows the eel to swim freely instead of squirming and tangling up your fishing line. There are multiple ways this can be done but this is our best way to hook live bait for eels. When we are hooking a live Eel we use a large hook. A Owner 8/0 or 10/0 is what we recommend for hooking Eels. It is important to remember the constantly replace the water that the hooked Eel is in. This ensures that the water stays clean and well oxygenated so the Eel can stay as lively as possible. When using live Eels we try to stay away from smaller sized Eels. The smaller the Eel the harder they are to keep lively. Larger fish are attracted to a bigger eel in most situations. The bigger Eels move faster and makes more commotion making the predator fish more aggressive. A 12 to 18 inch Eel is what we recommend. Learning how to hook an Eel takes some practice but using these few tips will help make it easy. If you would like to see how to hook an Eel click the Video below! Finao Sportfishing’s fishing charter is one of the best ways to catch fish and learn how to fish in the Chesapeake Bay. Whether you are new to the area or have lived next to the Chesapeake Bay your whole life a fishing charter is for you. With our convenient location at Vinings Landing Marina we are just minutes away to some of the best fishing Virginia has to offer! Starting off new to saltwater fishing can be difficult. With all the different tides, seasons, and species of fish it can get confusing to fisherman. On Finao Sportfishing we make it easy for you when scheduling your fishing charter. We factor in all circumstances to make your trip with us a memorable and successful fishing trip. With our new and updated website booking your fishing charter couldn’t be easier. It is as easy as clicking the “Book Now” button on our website. You can see availability, what species of fish we will be targeting, and schedule your trip all online. Your fishing charter with Finao Sportfishing will be more personal than most other charter boats. With the Captain / Mate always being close by there is never a time where you will be unattended. We make sure we share the best fishing techniques and teach our customers for the best fishing experience possible. 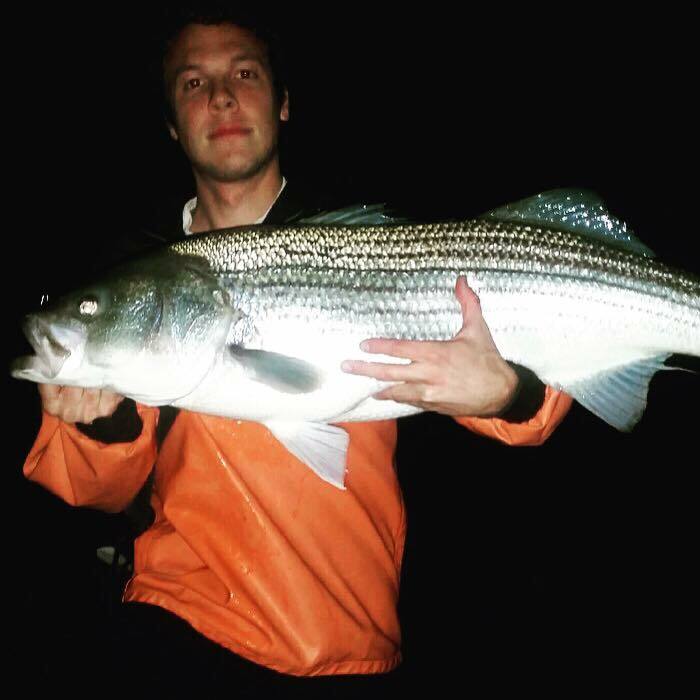 Whether you are a angler of 50 years in the Chesapeake Bay or a first time fisherman we are sure to give everyone a fish catching and memorable fishing charter. Our 24′ Cape Horn is designed for safety, comfort, and fish catching. We have a custom built Sight Fishing Tower placed on the T Top for species like Cobia and Red Drum. Below we have a Lowrance Fish Finder designed to spot all the fish that swim beneath the surface. Everything on board our fishing charter has been made for an excellent fishing experience.